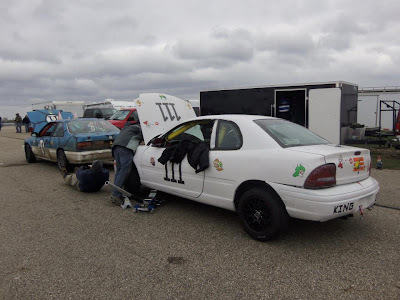 We survived a blustery and occasionally flurry-filled 24 Hours of LeMons weekend at Southwest Michigan's Gingerman Raceway, where we worked the Penalty Box as a guest judge. By and large, the racers were a pleasant bunch and the racing itself was mostly clean. 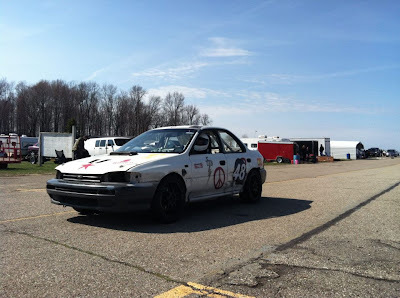 Well, clean in the sense of no contact; pieces of broken car, freedom-seeking fluids and at least one transponder (or pieces of it anyway) littered the racing surface, but that's par for this hooptie course. 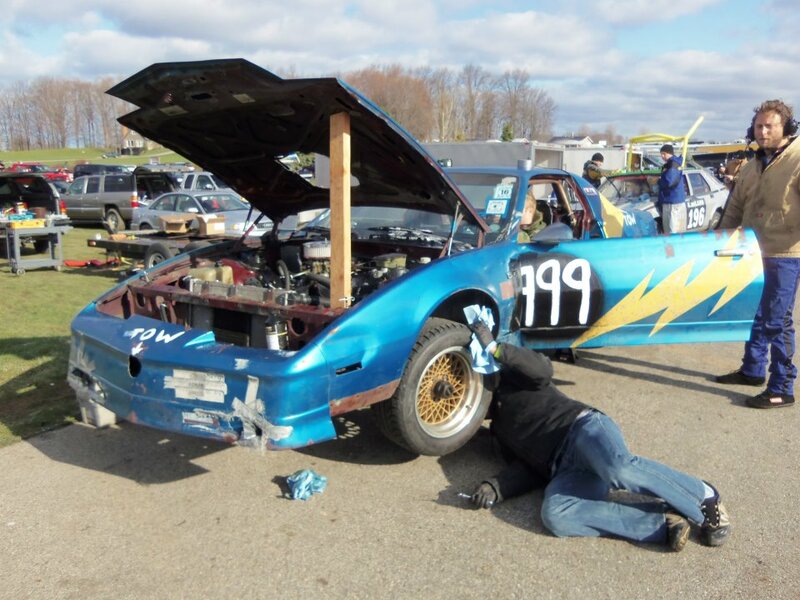 At the end of the weekend, Bucksnort Racing stood atop the heap of heaps with their second race win by just three laps over the Little Lebowski Urban Achievers. Judge Phil has already written about the winners here, so we'll just highlight some of the additional things we noticed throughout the weekend. The lap totals will tell you that there could almost have been a sub-class of Class A for the top three cars. The Lexus suffered through multiple penalties Saturday, which cost the team any chance at an overall win with Bucksnort running a nearly flawless race. Blueberry Fields Forever's Impreza--a theoretically fast car with an SVX engine bolted up to a later-model Subaru 5-speed--surprised the hell out of just about everyone. This car was in fourth place with 20 minutes left in the race, but the car made a very late stop and came in on the tow strap with just a couple minutes left. Their late-race bad luck dropped them down to seventh, which is still a fantastic finish for a historically bad crapcan make. 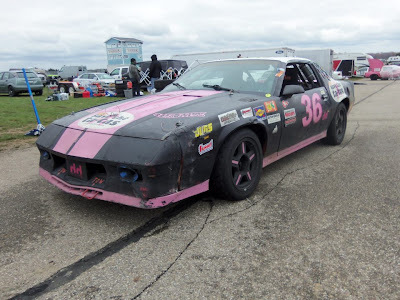 Similarly, the Save the Ta-Tas Camaro has suffered through failures of many kinds in three years of crapcan racing, but things finally went well for the Ta-Tas this time around, nabbing that rare General Motors Top 10 finish and running the race's third-fastest lap (after Bucksnort and Don't Mess With Lexas, respectively). As we'd hoped, Class B rang the bell for insanity and couldawouldashouldas. Team Gutty ran what amounted to a near-perfect race: Only one black flag all weekend, no mechanical issues, consistent-but-not-super-fast driving and maximum-length stints. Frankenstein Motorworks performed similarly well, quietly racking up lap after lap with the Accord's fuel-sipping motor keeping them on track for long stretches at a time. Ultimately, they were a little slower than Team Gutty and finished just outside the Top 10 overall. In their SHO-powered Geo Metro, Charnal House set what must have been a team record with just two black flags and no major mechanical setbacks. From what we could tell, their biggest issue came when the car's significant bumpsteer--the suspension is extra hooptie and the car is generally squirrelly--used up a driver physically, forcing an unplanned driver change. An off-track excursion for the Point-O-Eight cost at least 10 minutes while it wallowed in the beach at Turn 11, but they ran trouble-free otherwise. 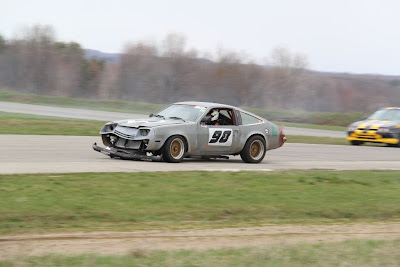 Apocalyptic Racing suffered through brake wear issues and ran out of fuel once, but their truck-engined Celica held together far better than its last run at Gingerman. The Festiva snuck up the standings Sunday and proved reliable but somewhat limited by the size of the sub-compact's fuel capacity. 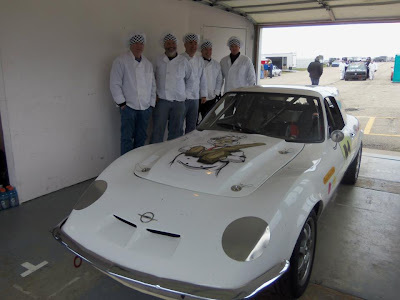 Bad Mojo Racing's Opel GT, however, shocked just about everyone in the paddock by climbing as high as second place overall and sticking around the middle of the Top 10 for most of Saturday. However, nagging issues dropped the field's oldest entry out of the running late in the day and kept them out of it entirely Sunday. Four of the six Class C entries walked away with awards, but probably the most incredible thing is that all of these cars ran all weekend, aside from the time Loose Lugs was forced to sit on Saturday for black flag and some typical minor repairs. The Ford Tempo--a truly wretched heap featuring one of countless bad Back to the Future LeMons cars and a power-sapping automatic transmission--somehow turned the class' fastest lap by nearly a second over the Loose Lugs S10. We're still not sure how that happened, but it might have something to do with it being a "driver's car." The Zero Budget diesels were glorious to watch putt around the truck, even if they couldn't crack the 2:00 mark. They finished in formation, just like those diesel Audis at that one race in France. As we've said before, our favorite part of crapcan racing is knowing that each team has its own story. Here are some short versions of some teams' stories from the weekend. Of course, all crapcan teams have a certain talent for long-form storytelling, so ask them to share next time you run into them. The Flying Pigs and their terrible Ford Mustang shocked the LeMons' judging panel by clawing their way up the standings to as high as fifth late on Saturday until a panicked team member showed up at the Penalty Box because the car's laps weren't counting on Race Monitor (Pro Tip: Sometimes, Race Monitor is just being flakyy when this happens). The Pigs called their driver into the pits, only to notice a blank space where the transponder had been mounted near the car's front. They managed to rent another one and install it more securely, but lost about an hour in the process. When the track went cold, they found the transponder's remnants near Turn 3, where a rough tangle with the rumble strips had sent it careening into the weeds. They turned in its remains but were still on the hook to replace it while also losing about 30 spots in the standings. This would ordinarily be an I Got Screwed candidate, but they mostly screwed themselves through poor transponder mounting. The lesson here? 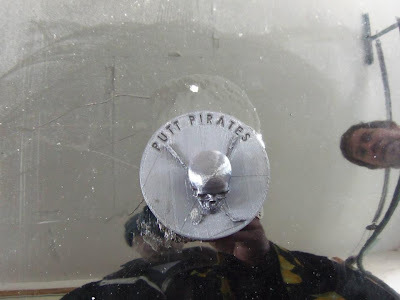 Mount your transponder somewhere safe and not near the car's extremities, like the outside of a spare tire well. When the (relatively) late-model Volkswagen Golf of The Putt Pirates pulled up to BS Inspection with a super-lame "golf" theme, we sweated this new team pretty hard, scouring through their pages and pages of their budget documentation simply to make them perspire and insist on the car's legitimacy before we handed them Class A with no laps. They proved to drive the way new teams frequently do, picking up enough black flags to get the saran-wrap penalty Saturday. 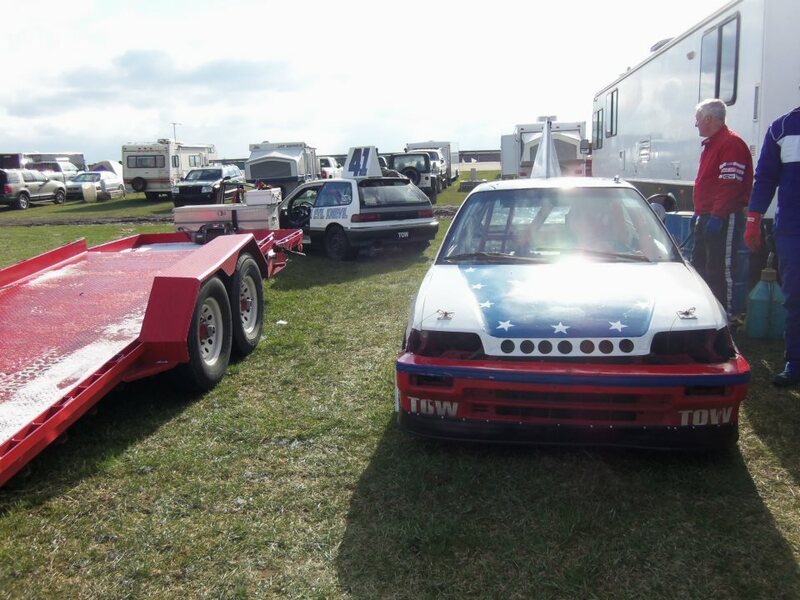 On Sunday, three quick flags led Judge Phil to make them turn their lame theme into a sweet duct-tape flame job that would make rat-rodders...well, not jealous...but something. 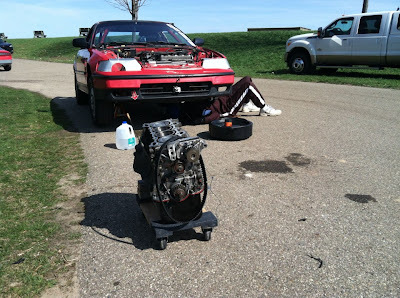 They endured their weekend--which included a transmission repair with JB Weld--with aplomb and good humor. Read the team's two-part write-up here and here. In the Midwest, the Blue Shells' Honda Accord is regarded as the team to beat in Class B, having figured out that the way to win the middle class is to simply stay on the track and give way to fast and aggressive drivers. 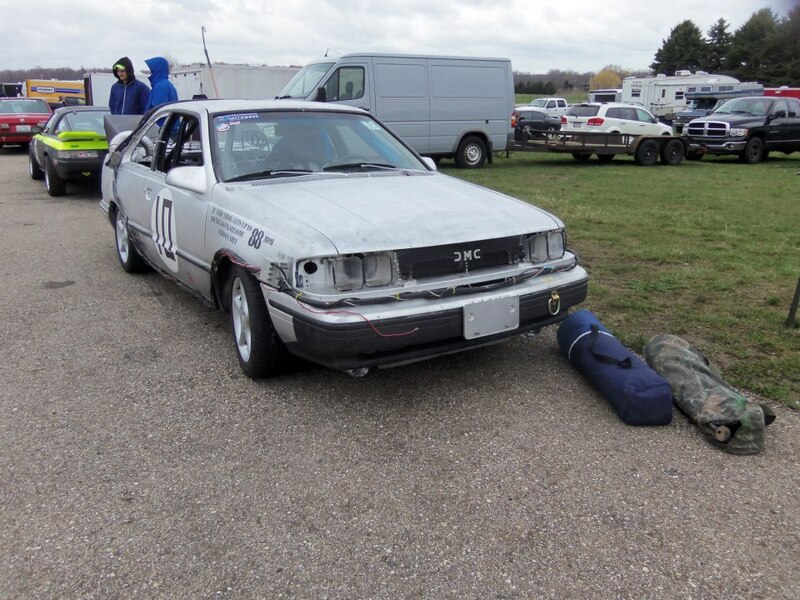 We expected them to contend for the win in Class B, but the Accord's rare Honda A20 motor had other ideas, crapping out early on Saturday with no replacement in sight. However, the Blue Shells' second car--a Dodge Neon with the fragile 16-valve engine--found itself in third place at the end of Saturday. It wouldn't last, as the Neon faced terminal suspension issues and was forced to retire early Sunday. With the Accord's A20 motor getting ever-harder to find, the team may upgrade to a Class A-type motor, though they may miss the next LeMons race a Autobahn Country Club in June. 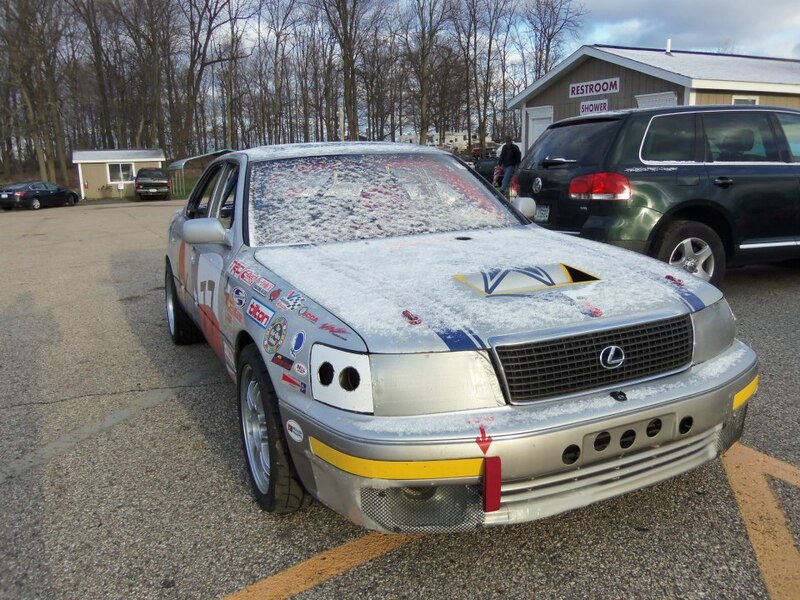 When you bring something as crappy as a 4.3L V6 Chevy Monza to LeMons, you're typically asking for trouble. The Usual Suspects ran into all kinds of (typical GM) problems during Saturday's long 9-1/2 hour race session, from bumper-removing contact to a grenaded transmission. The team found a questionable replacement transmission some distance away and spent much of the time between race sessions making one working driveline from two iffy ones.They also donated a magnetic pizza delivery sign to the judges, who then passed it onto the K-It-Fwd program, where it may find good use. The LeMons Supreme Court usually invites clever penalty ideas from competitors. Team Evel Knievel gave a great one, bringing two 580-piece Lego Formula 1 models that would be great for Penalty Box recidivists. Coincidentally, the team's Class B #41 Honda Civic found itself in the Penalty Box often enough to be on the receiving end of their own penalty. They knocked it out in less time than the other team given the same penalty and were back on track in about an hour. 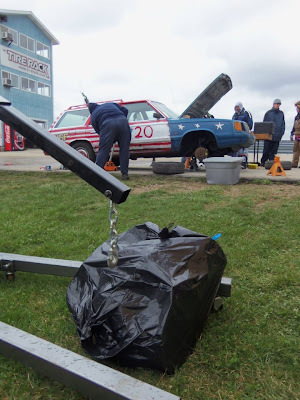 When the stiffly sprung Honda CRX of Red Wagon Racing came through BS Inspection, the team complained about getting assigned to Class A. 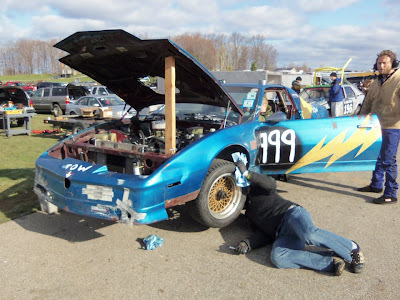 Under the provisions of LeMons' "No Whiners" rule, we docked them a single penalty lap for complaining. On Saturday, the car had nearly completed its first lap when the timing belt snapped and bent a valve or five. The tow through the pit lane crossed the start/finish line to negate their penalty lap. The team tried swapping a new head onto the block but stripped out the block threads, rendering the block useless. Had their weekend ended there, they'd have been I Got Screwed candidates, but they instead swapped in a new engine and almost had it ready for Sunday's green flag. It didn't last the whole day, but they'd gone through extraordinary efforts to log any laps at all. 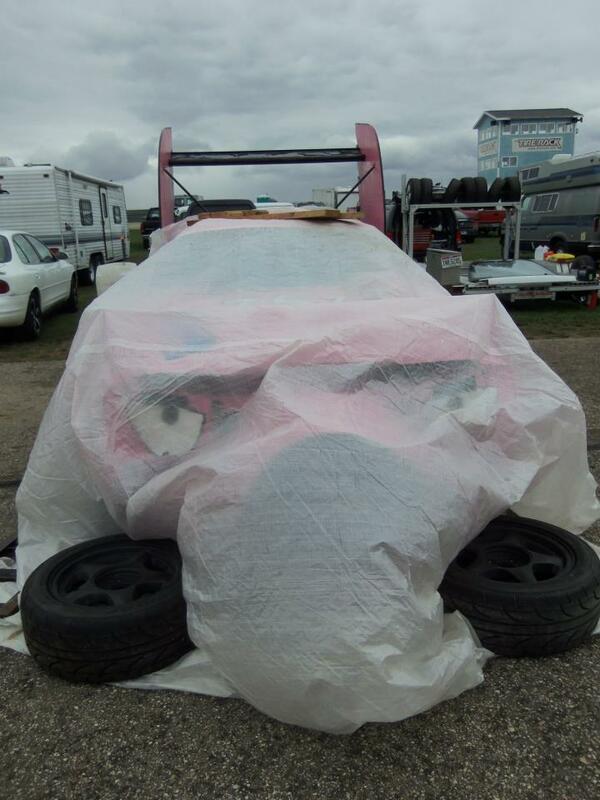 We don't have an exact count, but we're pretty sure this car has been through as many engines as it has races. The #999 Pontiac Firebird of Testi Rossa Racing is, hands down, one of the worst cars we've ever seen. Like any good, classy F-Body drivers, these guys put a set of disturbingly vein-y TruckNutz on their heap, which promptly fell off during one of the few instances where it was running on the track and not being yelled at for spewing fuel. The driver allegedly radioed the team when it happened, saying simply, "The nuts just fell off." 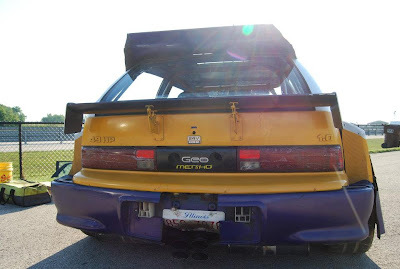 Luckily, no one's race was ruined when a giant novelty rubber scrotum split a radiator in two. Visit The Rusty Hub's Facebook page for more photos and updates.